Father Anthony was assigned to the parish and people of Saints Constantine and Helen in 1995. He hails from the Pacific Northwest, where he was introduced to Christianity in high school through Young Life. He continued his ministry with that organization while attending Westmont College in Santa Barbara, California. Father Anthony completed his bachelor’s degree in psychology at the University of Colorado in Denver before moving to Colorado’s western slope to initiate high school ministries for Young Life there. Father Anthony’s conversion to the Orthodox faith was a gradual process of awakening. The writings of the early church fathers had an enormous influence in his spiritual development, especially the works of St. Maximos the Confessor. Father Anthony recalls his acquaintance with the mystical theologians of the church as having opened a spiritual ocean where once had appeared only a swimming pool. He and his wife Elizabeth were received into the Orthodox Church in 1988 at the small parish of St. Andrew’s in Delta, Colorado. Father Anthony studied theology first at Fuller Seminary in Pasadena, California and then at St. Tikhon’s Orthodox Seminary in Pennsylvania. 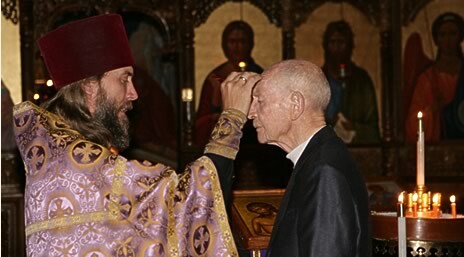 He graduated from St. Tikhon’s and was ordained a priest in 1995. 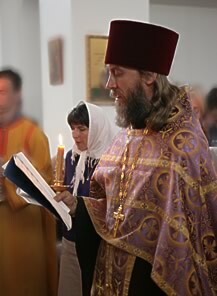 He was assigned by His Grace, Bishop Tikhon to Colorado Springs later that year. Listen to an interview with Father Anthony on Ancient Faith Radio: From Young Life to the Priesthood.